Hello, hello, hello to YOU, and Happy Birthday to OWH's Ciara!! Thanks so much for stopping by today during the "All Creatures Great & Small Blog Hop" presented by Misty at DeLiteful Gifts!! I'm so pleased to be a part of this hop, and I'm super-excited that YOU are here!! If you arrived here from Getting Cricky, you are in the RIGHT spot!! If you've just happened along, be sure to hop back to Misty and begin at the beginning!! :) When you're done here, you'll want to hop along to TANYA, who has a creative critter in store for you too -- But be sure to leave a comment here first to be eligible for the Blog Candy!! Misty asked each participant of the hop to create a 'Kid-Friendly' card or project with a creature great or small... In an effort to promote and support Operation Write Home, I designed this fun MONKEY card!! 3. Amy...http://www.lovetocrop.com/ You are Here! 4. Tanya…http://scrappinkymomma.blogspot.com/ <- Next Stop! I LOVE it Amy! DYMO? LOL! Didn't know they were still around! Glad you resolved the problem. Thank you for joining me in my hop! Monkeys are always so cute, and here is another example of that. TFS! Too cute Amy!! The monkey is ADORABLE and the "vine" really sets it off. Great idea!! Good lord, take me back to the day.... a Dymo! What a fun card. Such a cute card! Please stop by to check out mt card...fellow hopper #7 upsydaisycreations.blogspot.com. I am part of the blog hop team & have become a follower of your blog. I love the way you wound the twine around his arm!! I love your card and your site. I am your newest follower. Thank you fro donating to OWH. This is a great organization. I am so happy to see all these talented people donating their cards to OWH. Our military children will be so happy to receive these friendly critter cards. So cute Amy, great idea with the twine. I'm a follower too by the way. I love the zine twisted around the arm. I am a current follower. Love the card. This made my decision to get the Creative Memories cartridge. What an awesome card for some kid to get from mom or dad!!! Love!♥♥ your Monkey Card...Too Cute!! I am loving this blog hop, with all the cute little animals!! TFS!! I am a very new Follower and love to follow cool Blogs!!! My blog has a cool post that I did yesterday!! I've been a follower for a while! Love your blog. I really really love it!!! I love monkeys!!! CUTE! Hi Amy! Your card is so adorable! I know one of our heroes will be so happy to use it!! Bless you! Great project! Super cute little monkey! Very cute card! Love the old school label! Already a follower. 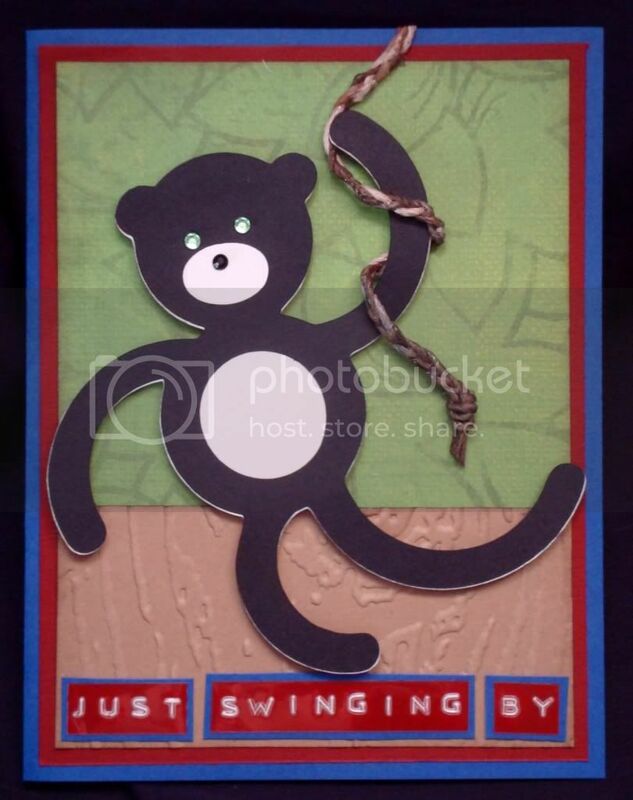 Love your monkey card and the vine is relly cute. nana5604 at gmail dot com. haha, I love this card! The swinging monkey is adorable! I am a long time follower! Such a cute card. Thank you for sharing! Second comment: Just wanted to let you know I am a new follower. I also found you via K Andrews Getting Cricky Love Link-Up. I love the card and how you went old school. I am a new follower, thanks for the chance to win some great blog candy. Amy this is so so cute. im following you too now. I loved making all my projects for this hop its so cool! very cute monkey card. 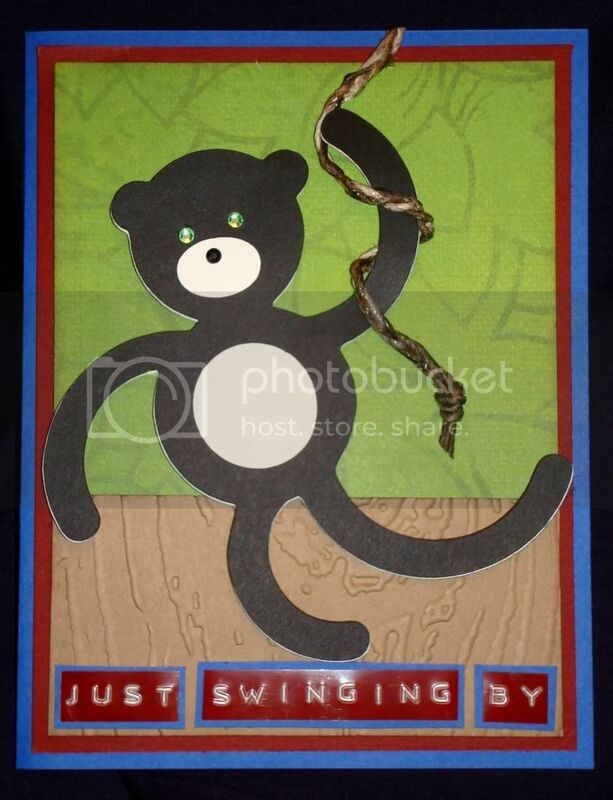 A kid would love to get this card, well so would my husband's friend who is nicknamed Monkey. LOL I make him monkey cards for his birthday every year. 2nd entry, I am already a follower. love your project and how you put a real "rope" in his hands. Great touch! Enjoyed being in the hop with you! i so need this cartridge. 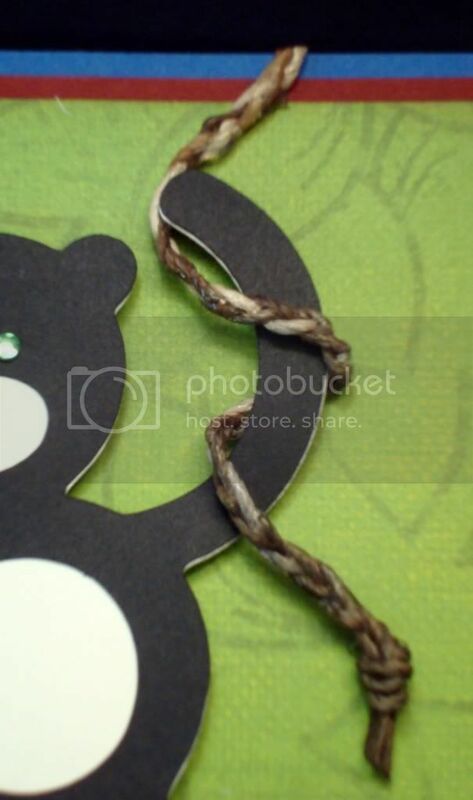 this monkey could have been used... LOVE ur card..
That braided vine is fantastic!! And I love the way you used little labels for your sentiment. That looks SO sharp!! 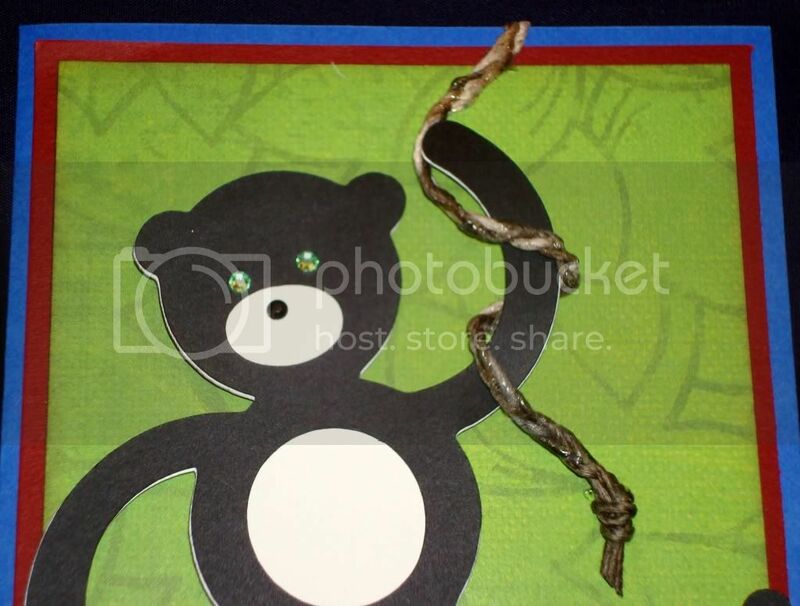 Such a cute card and one that any child would love! Just adorable! Oh! Almost forgot... I'm already a follower! I have been a follower for a while not and am happy I am. I just love your monkey card. What a great idea for your sentiment. WINNER of my THANK RHONDA BLOG CANDY! !